Hafi TRIOSCRUB - JR. & SR. built to the needs of Indian working conditions, in particular to the problems faced in Industrial Shop Floors like removal of stubborn stains/muck, accumulated over a period of time as is typically found in heavy industrial establishments. The three ideally positioned brushes, driven by a standard capacitor, 'hi-torque' motor can be cover a large area with remarkable ease. Power is transmitted to the brushes through belt and pulley drive. For Wet Scrubbing, a solution tank allows free flow of detergent water to the center of brushes and the detergent flow is effectively controlled by a hand lever ideally located. The unit can find applications for cleaning of concrete, marble, granite and industrial floors. TRIO SCRUB - SR. can also do heavy scrubbing operations with great ease. 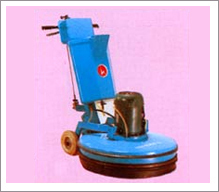 A Powerful Machine useful in Industrial Shop Floors for removing stubborn stains/muck. A unique wet scrubbing useful in cleaning of concrete, marble, granite and Industrial Floors. AREA COVERAGE 550 SQ. MTR./HR. 450 SQ. MTR./HR.